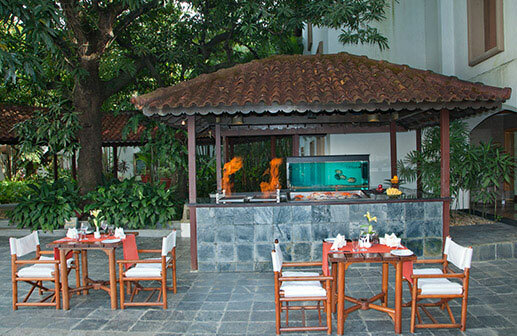 If you are a seafood aficionado, head to The Seafood Grill at Trident, Cochin for a poolside dining experience where you can enjoy the fresh catch of the day, including a selection of fresh lobsters, prawns and fish. Our chefs will be delighted to prepare your seafood just the way you like it. At the Seafood Grill, our wide selection of fresh delicacies are complemented by homemade marinades inspired by French, Spanish, Moroccan and Keralan cuisines, or seasoned with Indian spices blended to suit your palate. For the ultimate fine dining experience, we recommend you accompany your meal with a glass of fine wine from our extensive menu. The Seafood Grill is open from 7.30pm to 10.30pm for you to enjoy a relaxing dinner with family, friends or to wind up a day’s business with colleagues in style. Please note: For your comfort, the al fresco restaurant is open from November to March only. 7.30 p.m. to 10.30. p.m. Please allow us upto 12 hours to confirm your reservation. Our chef's twist on the spicy fish curry, Meen Vattichattu, is simmered in an earthern vessel, flavoured with curry leaves and red chillis. Choose from a fine selection of our creative cocktails and classic spirits at Cochin Trader Bar. Kerala Sadya is a traditional Kerala meal with a 12-course menu. Choose from a host of vegetarian and non-vegetarian dishes, served on a banana leaf.